What is it like to work on a small, locally based cruise ship? 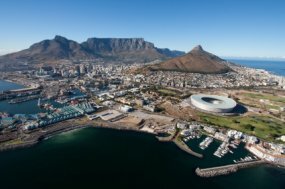 Find out from a human resources representative with The Waterfront Boat Company in Cape Town, South Africa. Learn about life on a small sightseeing cruise ship! The Waterfront Boat Company is the premier boat company in South Africa with sightseeing tours and harbor cruises out of Cape Town, departing from the V&A Waterfront. Our most popular cruises are the Sunset "Champagne" Cruises, Whale Watching Cruises, Jet Boat Rides, and Wine and Dine Cruises. I am in charge of the hiring of employees and am involved in the training of the staff. If you want to work on a cruise ship in South Africa we are a good option. Our fleet includes 3 motor cruises, the Sea Princess, the Condor, and the Southern Cross, 2 sailing charters, the Esperance and Spirit of Victoria, a small harbor ferry, the Dawn, and then our 2 jet boats, and Freestyle, which is our sloop rigged sail boat that we use for our Sailing Academy. Our cruises emphasize fun, and the experience on board for our employees is also fun, although they will be working hard. We frequently require crew members to help operate the vessel, assist with rigging and mooring, and who need to be SAMSA and RYA licensed. We also need stewards and bar tenders for some cruises, as well as sales representatives and skippers from time to time. Do you have a lot of college students working for you? Yes, the seasonal aspect of the work is the main attraction, and the fact that they get to do fun work over their Christmas holidays. The cruise industry is all about tourism. Most cruise companies around the world offer tours to foreigners and tourists from other areas, so you must be good with people, have a good grasp of the tourist market in your area and understand customer service. For seasonal staff, you can expect shift work and to be paid by the hour. For sales reps and short based staff, hours are usually 11am to 9pm. A lot of seasonal employers have trouble keeping staff for the whole 'season.' Do you encounter this, and do you give incentives to keep staff for the whole season? No, our employees love their jobs! Most applicants that come to us stay with us because we are the biggest company in the area. We normally attract people who are young and adventurous with a love of the ocean and who are free spirited. Those interested in tourism also come to us to get more experience in the marketing and sales side of things.